Fig 1: This is the screen where you give RSS Bandit permission to access your news feed. 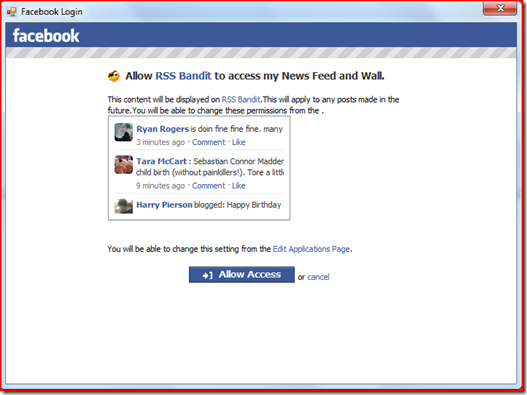 Note that this is different from the screen where you login to Facebook via RSS Bandit. You should only see this screen once but will get the login screen quite often unless you select the option to stay signed into Facebook via RSS Bandit. 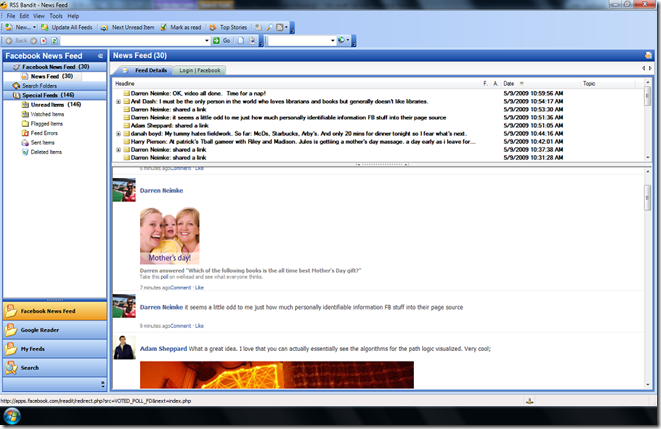 Fig 2: This is what your Facebook news feed looks like in RSS Bandit with the default stylesheet for Facebook applied. 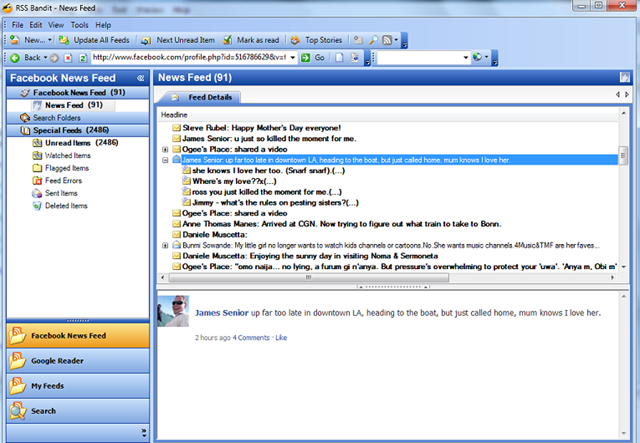 As you can see from the screen shot I’ve attempted to replicate the look of the news feed as best as I can in RSS Bandit. This includes options below each item to comment or see who has liked an item. 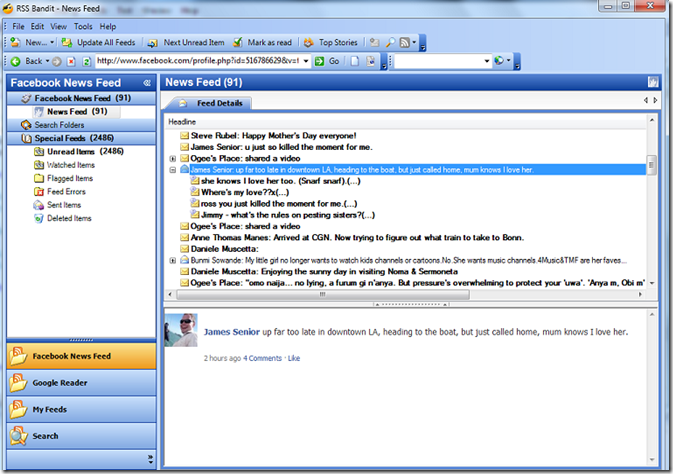 Fig 3: There is also support for viewing the comments on a Facebook item inline within the Feed Details list view. Although this is different from how Facebook does it, I felt this was needed to make it consistent with the other inline comment viewing experiences within RSS Bandit. There’s still a bunch of cleanup to do such as fix up the look of comments when you click on them and provide a way to post comments on your friends’ Facebook items. This is probably another day or so of work which I’ll do next weekend. After that it is back to fixing bugs and working with Torsten on our idea from over two years ago on how to add a Office 2007 style ribbon to the application. When adding a ribbon, think carefully about which commands are used most often - EG Next Unread, Mark As Read etc and make those most prominent (EG Large Icons on the Left). Lesser used commands (EG changing display style) should be relegated to smaller icons, separate tabs or the application menu. Please don't dump everything into one or two tabs and put in lots of big galleries just because you can. Please inc QAT if possible. Gallery for themes is nice but not sure worth the effort for a set & forget type change. Can I request a theme with all the review flags and "naked" link styling so cut n paste to blog is clean. Looking at the Big Red X of dead RSS Bandit interface graphics as I type hoping the Ribbon won't do that!